Chunga's good, good do well at a Eurovision, I like that we have a couple of popular female solo pop stars doing their thing now. sigh, that Jonghyun video is making me sad all over again. He really was one of the best. Just can't get behind Ravi as a rapper (he's an OK producer) but nice to see Park Jimin getting some work. The whole album is great but I can't quite bring myself to replay it. It's #1 on iTunes BTW. Loona stuff continues to sound quite different from release to release but maintain its cool, and a conceptual consistency. I guess I'm in the minority that likes Bad Boy more than their last two singles... winter is the best season for RnB and the production on this is so nice. I really like the Go Won track too! I like Bad Boy a fair amount, and more than Peek-A-Boo, but it's summer here. it's probably their best r&b single so far but Red Flavor is my favourite single of theirs. Thoughts on Holland, the first openly gay idol? song isn't great imo but am glad there's actual making out in the video. He has a nice voice (Holland). The BF is cute. There have been other idols who were all-but-out but it's something different to have a scene that purposefully removes the ambiguity. I wonder if he'll end up with a niche audience like Double A (never forget). yeah someone on omona pointed out that even Adam Lambert hasn't had any gay scenes in his videos, which honestly surprised me considering how long he's been out. I'm reading that most of Holland's fans are international, which could be a problem for him financially (again similar to Double A). A solo singer is a lot cheaper to produce than a group though, hopefully he'll make it. I have to say that I like Love Scenario more than Beautiful... on the one hand Love Scenario is really minimal and sparse, so on that count it's kinda boring but on the other hand it's got the old-tyme-country feel with the weird off-beat rhythms like Bae Bae had and that's a recent YG production trend I enjoy and support. It's young, hip, melodic, retro, current, and has an easy chorus. And for once the easy chorus/dense throwback harmonies aren't at odds with the rest of the song! Though I do like BOSS too. Like here, they are still making unusually melodic hip hop over a decent beat, but they don't know how to incorporate the more traditional "kpop" melodic content, except by suspending the beat for a few bars. Sober is quite good but I think I'd like it more if it had a moment of cartharsis like Bad Liar does with "oh baby let's make reality actuality" etc. I really like all the overlapping vocals in the Baby Don't Stop chorus, definitely one of the best NCT singles. Right??? And right before it ends, there's some straight-up jazz do-wop harmonies. Lol this is the first time I'm watching the "BOSS" video - that is both great and hilarious. And "Baby Don't Stop" is just great, period. Those vocal arrangements are incredible. Bad Boy has grown on me quite a lot. Roller Coaster still great, glad to see Chungha killing the charts. Interesting to see if Momoland can follow up BboomBboom and become a truly major group. I enjoy their Egyptian Shumba-like screams live. Seems Japanese interest is high. @Roz that's not the official video for BOSS, it's just something MNet does. I kinda prefer it tho lol. Is there some brand value to putting "ft Jay Park" on a Loco song? Because I'm not sure what he adds to this lmao. What's the 1 thing preteen girls love more than Boyz? Also JYP on a roll with the self-produced boygroups... this one has a rock/hiphop sound as if some Korean American kids who grew up on eminem and linkin park were later given a chance to produce an idol group. this one has a rock/hiphop sound as if some Korean American kids who grew up on eminem and linkin park were later given a chance to produce an idol group. oh good, i was trying to figure out where that familiar sense of secondhand embarrassment was coming from. Their sound design is incredible - i can't wait for their group debut. I think she's a little weaker than other vocalists in LOONA, which makes the chorus sound lacking. But her emoting on the verses is good. I like the last section starting at 3:45 when they put all the echo effects on, other sections were a little predictable. Could use maybe a change in tempo or volume though. I was a bigger fan of DDD. Love this track, sounds very SHINee-esque. 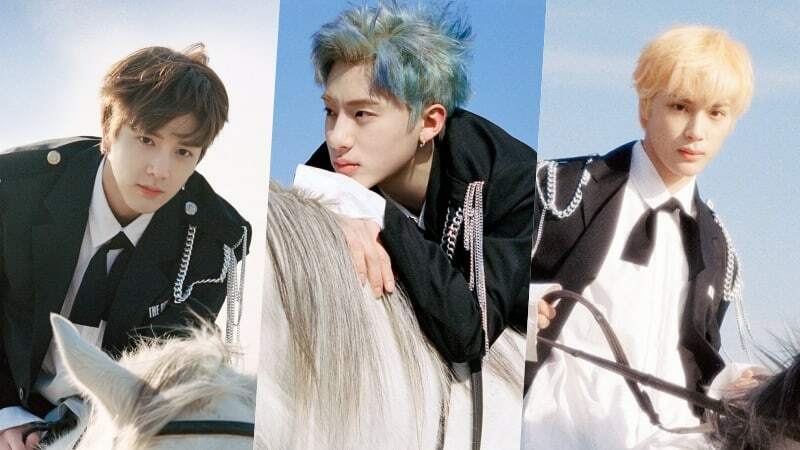 I'm a fan of Giddy Up, even if they didn't put the horses in the actual MV. I've actually never heard of this group - came across via Youtube autoplay. Extremely enjoyable! They're from the survival show Idol School, I think. Kind of CJ E&M's answer to Mnet's Produce 101 or KBS's The Unit, but not as popular as either of those. I think this is the first fromis_9 track that's gotten any traction with the general public. new TWICE is fun, certainly one of their best singles. feels kinda Kylie-ish? Me too Frederirk, me too. I think TWICE might repeat the chorus many one or two too many times, but it's pretty enjoyable. TT is their best song I think. Speaking of songs that will please fans, Key x Soyou is everything you'd want and expect from that collaboration, they both have such nice/contrasting voices and the song sounds like it could have been a b side on the last SHINee album. Both songs are simple but I like them. my top three TWICE singles are pretty easily Likey, Yes or Yes, and What Is Love? I'm really glad Key is doing well in this post-Jonghyun world - for a while there, it seemed like he might have been the hardest hit by the loss. Yes or Yes is great, and more Clueless-esque plaid skirts and berets! I like Tempo too, not least because SM has finally realised how popular Sehun is and decided to give him double the number of his usual lines haha. Have I mentioned before that I'm into the jazz trend in Kpop? Because I'm into the jazz trend in Kpop. US producers, you need to get on this. That's a collab between Park Jiyeon (ex-GLAM) and Park Kyung, by the way. It kinda has a similar aesthetic to EXO's tempo, but younger / edgier / trendier. So have there been any consensus stand out hits this year? Out of curiosity and also, of course, looking forward to the ilx best of the year voting. I could support GIdle, maybe Sunmi, BTS, well, they've had a year anyway. Will probably add IU, though still disappointed we didn't get her top 77 last year. I'll be voting for BoA's Woman in the album poll. That's a great list, ufo... I'm down to vote for everything on it up to Siren. **Mostly as a stand in for the songs from these artists I wish I'd nominated last year lmao, but both songs are pretty hooky. Fully expecting this trend to jump over from Korea to the US at some point, or maybe that's just my wishful thinking. To let you guys know how serious this is, we have two local very good jazz stations these days they are the only thing I listen to on the radio. and these songs have grown on me a bunch, so this year is my chance to make amends. Also add CLC - Seventh to that JAZZ WATCH 2018 list, I think I might nominate all the tracks on it just for laffs. I love oh! my mistake, have you seen the video of April doing it live acapella after the audio cuts out at some college festival? They aren't power vocalistss by any means but much stronger than I'd thought. Not sure if there's a consensus pick yet but I *still* haven't gotten over the vocal arrangements on NCT U's "Baby Don't Stop" so that's probably going to be my highest-placing K-pop pick. TWICE - "What is Love?" SF9 - "Now or Never"
April - "Oh! My Mistake"
Also was this ever posted here? TSJ reviewed this a couple of weeks ago, and it's incredible. WINNER track is really fun! Seungyoon sounds good in that range and Mino's rap is really fun at that speed. I like the BoA a lot too, SM stays on point with the Latin fusion tracks. Though how legitimate a list that doesn't include NCT U - Baby Don't Stop is, I don't know. Happy holiday whatevers K-Pop people. Here's a playlist with all the songs discussed on the thread this year. I'm just about to check if it's on there, but the best kpop song of 2018 is Heize's Jenga. For some reason, I'd been thinking all this time that it came out last year. Hopefully someone else nominated it. Not there, dang :( I'll just continue to talk about it up in this thread then, maybe one day I'll be able to forgive myself for not nominating this and First Sight. this Heize track is pretty great tho!